Transparency creates trust. Trust sells insurance. This session on price is about creating trust, value and earning the order. If we all agree the above truths are accurate and truly true, why are producers afraid to talk about them to their clients and potential clients? Transparency creates trust. Trust sells insurance. Another truth we all are about. This session on price is about creating trust, creating your value (value is meaningless unless you compare your value with something the buyer knows and understands) and earning the order. And, oh how to understand the buyer's window of pricing. PS: Have you ever asked a potential client how she trains her salespeople to sell? I bet none of her answers are "how to present the lowest price." 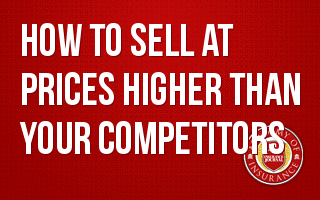 If your buyers don't train on how to sell on price, why do producers focus on price? And, one more "oh." I know an agent who wrote a book, "How to sell insurance on price. It ended in Chapter 11." You'll turn away from your computer at the end of the session with strategies plus words to use to move price to just another piece of how your buyer buys. Not the major piece.